Marijuana, ecstasy, cocaine and many other drugs are all still out there as drug options for teenagers to explore. Each day, however, there are new, emerging drugs that children and teenagers experiment with. Working in law enforcement, I see everything from horse tranquilizers to floor cleaner being turned into some sort of drug that children either smoke, inhale or snort. Parents need to familiarize themselves with these drugs that may all be somewhere in your home and they don't even know it. Understanding the drug and its side effects can help parents identify when their child is using and how to help them. One of the most notorious places where drugs are rampant is raves. Raves are a social dance party or gathering that commonly plays loud computer generated or techno music. Laser light shows are common at these parties, along with club drugs being highly promoted to all attendees. Water is sold at extremely high prices, sometimes $15-20 a bottle, because of the thirst experienced by attendees from constant dancing and drug use. Having worked security for raves in the past, I have seen the drug abuse by children as young as 12 years old at these so called "dance parties". What parents think is a supervised, controlled environment is actually a drug haven. 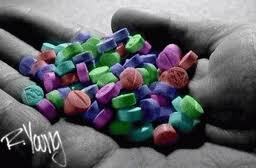 According to Deputy Sheriff Schaves of the LA County Sheriff's Department, some of the commonly sold drugs at raves are "X" or "E" also known as ecstasy, "Special K"or "Vitamin K" which is a potent horse tranquilizer capable of killing a human and "Roofies" also known as the Rohypnol. Many parents are familiar with Ecstasy and Rohypnol but Special K has become increasingly more popular because of its potency. The CNOA states that special K is especially potent. It works faster than PCP, gives the visual effects of LSD and gives children almost an out of body experience. The downside is all of the unpredictable effects associated with Ketamine such as high body temperature, increased heart rate and blood pressure, panic, confusion, suspicion, anxiety attacks and schizophrenia. It can even cause persistent psychosis. When taken in unknown doses, Ketamine can cause mental retardation and/or death. Although marijuana is a popular drug amongst teens and even some adults, it has begun to be sold in various forms in order to disguise it as a drug. There are new types of THC "candy" available. The Drug Enforcement Administration (DEA) has recently encountered the candy that is sold in in wrappers similar to Butterfinger and Snickers candy bars but is instead called "Buddafingar" and "Stoners". Until recently, these "candy bars" were sold via the internet to anyone that provided a credit card numbers. Each bar weighs approximately 60 grams and contains 20-30 milligrams of THC. There are also THCee lollipops. These lollipops come in different flavors such as cola, grape and Dr. Pepper. They are often labeled with the Compassionate Use Act of 1996 to appear to be legal and for medicinal purposes, however, they are illegal and you can still be prosecuted for having them in your possession. The scarier part of this is that these items can fall into the hands of young children who are not aware that it is a drug. Salvia Divinorum is one of the newest drug trends. It is the only hallucinogenic species of the sage plant. Salvia is currently legal in California and anyone over 18 can purchase it at local smoke shops. When smoked, Salvia can give a sense of having an out of body experience. Smokers of salvia lose complete control of their extremities and experience a similar high to that of marijuana. Hallucinations are common when smoking salvia and further damaging effects are still being studied. Kratom is another drug that is sold under the pretense that it is only an incense. Common names for Kratom are Kakuam, Ithang and Thom. It is either chewed like tobacco or brewed in a tea. The high will last about 2-6 hours and it's similar to that of a heroin experience. It prolongs sexual activity, gives extreme energy and increases heart rate. There are hundreds of other drugs on the street market that parents and law enforcement aren't even aware of yet. The important thing to remember is that parents need to be aware of their child's behavior. If your child acts differently, dresses differently, starts spending time with a different crow, you need to question their behavior and, if in doubt, drug test him. Drug tests are sold over the counter at most local drug stores and grocery stores and parents are encouraged to use them if drug use is suspected. Even if drug use isn't suspected, it provides your child with an excuse if and when he is approached with drugs to experiment with.